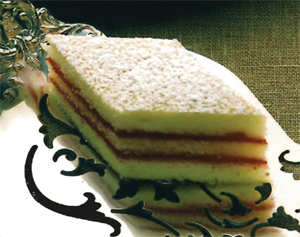 The Shuman’s Jelly Cake is made using the original family recipe – three thin layers of pound cake, separated by layers of homemade red currant jelly. About 12 inches in diameter, jelly cake can be cut into about 50 bite-size diamonds for a finger-food dessert, or into 16 wedges if one wishes to eat with a plate and fork. Powdered sugar is included and can be sifted or sprinkled on top. Shuman’s Jelly Cake can be frozen for later use. Learn from our resident expert ... Click Here!